Nearly 4.5 million Americans are bitten by dogs each year, and half of these are children. Almost one in five dog bites, about 885,000, results in injuries serious enough to require medical attention. In 2012, more than 27,000 people underwent reconstructive surgery as a result of being bitten by dogs. Bite injuries include puncture wounds and tearing wounds, which are caused when the attacking dog clamps down on the victim. The jaw muscles and fangs (long canine teeth) puncture and tear the skin and flesh of the victim. Bites may also be accompanied by scratches from teeth or clawing from the paws during the attack. The most common target in dog attacks is the face, including the lips, nose, and cheeks. There are approximately 44,000 facial injuries treated in U.S. hospitals each year. The wounds from such attacks can result in disfiguring scars that can have lifelong physical and emotional consequences, especially in children. Facial scars and scars on other parts of the body may also require repeated painful and expensive plastic surgeries to try to reduce or remove the scar. Children and adults who have been attacked and injured by a vicious dog can suffer emotional trauma for the rest of their lives. These psychological injuries may have a lasting impact. For example, the victim may have difficulty sleeping at night or being around families with dogs. 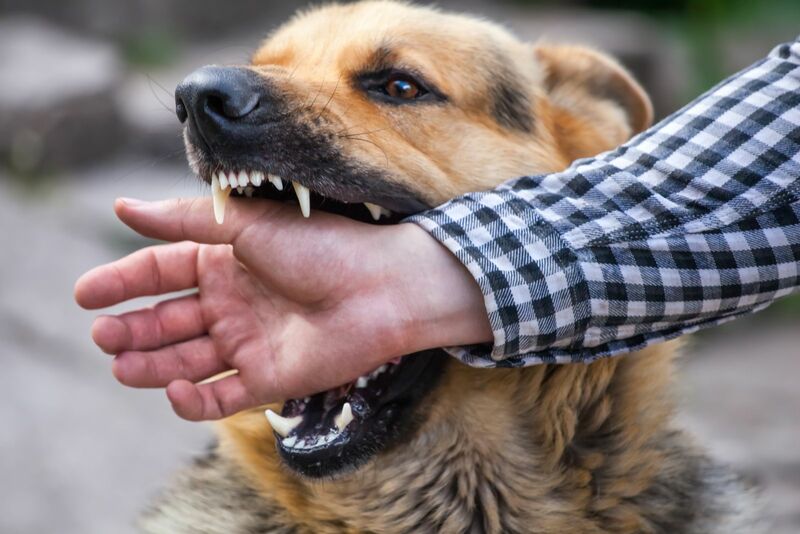 Some dog bite victims may develop Post-traumatic stress disorder (PTSD) with symptoms of frightening memories, flashbacks of the attack, nightmares, and an unreasonable fear for personal safety. They may also suffer difficulty concentrating and emotional withdrawal. Such mental injuries may require life-long psychological treatment and counseling. Rabies is a disease that attacks the brain and nervous system. It is transmitted in the saliva of animals infected with the rabies virus. Rabies may even be fatal if it is not treated in time. Dog bite and dog attack victims should seek medical attention immediately after being bitten a dog just in case the attacking dog had rabies. If the attacking animal cannot be identified, caught and tested, it may be necessary for the bite victim to undergo a series of six (6) shots, which include one (1) human immunoglobulin and five (5) rabies vaccine shots, over a period of 28 days. Treatment must be started early, before the rabies symptoms appear, or the disease will cause death. Head and brain injuries can occur: (1) if the dog bites the head of the victim, or (2) if the victim hits his or her head on a hard object while trying to fend off the attack. Head injuries may be as minor as a bump on the head with a temporary bruise or as serious as a fractured skull or brain injury causing permanent disability. When a dog attacks, the victim may suffer broken bones by being knocked to the ground or falling when running away from the attacking dog. The powerful jaws of some dog breeds can also cause bone-crushing injuries even when the skin is not broken because of protective clothing. Dog bites cause deaths every year in the United States. In 2012, there were 38 fatal dog attacks in the U.S. Pit bulls make up less than 5% of the total U.S. dog population. Despite being only 5% of the population and despite being regulated in Military Housing areas and over 600 U.S. cities, pit bulls contributed to 61% (23) of the 38 deaths. Rottweilers are the second most lethal dog breed, and they contributed to three (3) of the deaths. Together, pit bulls (23) and rottweilers (3) accounted for 68% of all fatal attacks in 2012. In the 8-year period from 2005 to 2012, Pitt bulls and Rottweilers combined to account for 73% (183) of the total recorded deaths (251). When a victim dies due to a dog attack, the surviving spouse, children or parents of the victim may be entitled to file a wrongful death action. If you or a loved one have been injured by an animal attack, it is important to contact an attorney right away to protect your rights. Attorney Nick A. Ortiz and the Ortiz Law Firm will conduct a prompt and thorough investigation, collect the important evidence, and will deal directly and firmly with the responsible parties. To contact an experienced personal injury attorney at Ortiz Law Firm and to get a free and confidential case evaluation, please fill out and submit the contact form on this page or call us (850) 308-7833.